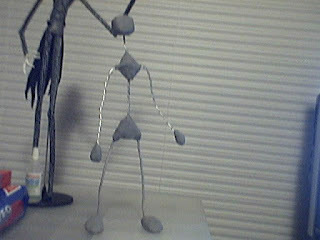 I finally made an armature! Now I need to drill some holes in wood and begin. I can't wait. Can't wait to see what you come up with on this thing. I was watching some of the special features on curse of the wererabbit the other day and they were building armatures for the little rabbits. And they put paper tape (I think like masking tape) on the metal to get clay to stick to it better. Im not sure if you have any plans of putting clay on this guy but if so just wanted to mention it. Great work man.